On Thursday, April 12, 2018, Visiting Assistant Professor of Music Charles Lwanga directed students from his “African Drumming and Dance” class in a performance that examined cross-cultural influences on identity. The performance used Malian artist Abdoulaye Konaté’s Métamorphose de papillon (2017), a recent Tang acquisition, as a catalyst. Abdoulaye Konaté is a Malian artist whose colorful fabric collages are inspired by costumes of Senufo musicians and rituals within the Ségou region in Mali and by the social complexities of postcolonial Africa. In Métamorphose de papillon, Konaté abstracts the butterfly (papillon), a common motif in his work, to serve as a symbol of fragility and transformation, which speaks to postindependent realities in several African states. These themes inspired my spring 2018 “African Drumming and Dance” class. I worked on blending traditional and modern⁄contemporary performance styles in order to articulate the effects of colonialism in Africa. On April 12, 2018, we presented a concert titled Musicking the Collage: African Music, Dance, and Art at the Tang Teaching Museum. Influenced by Konaté’s Métamorphose de papillon, the concert featured two Afropop songs, my own art music composition for violin and djembe, three Afropop drumming pieces, and two Afro-modern dances. Apart from my composition, each piece included a combination of African costumes (in multiple colors and designs), singing, drumming, and dancing that resonated with Konaté’s artwork, which was displayed in the performance space. Moreover, the concert represented performance practices of Africa as a constellation of arts rather than as individualized art forms. The performances articulated the African continent’s diversity, but while each entailed a sense of “Africanism,” none was purely “African” in style or choreography. In the first song Tweyanze (We Thank You), for instance, we blended Luganda, an indigenous language of the Baganda people of Central Uganda, and English, a colonial language. The song was about indigenous spirits that give life, good health, and success to loyal mortals. The song’s accompaniment was an electronic track that a student, Chidubem Udeoji, and I worked on during the semester. It was accompanied by two dancers who performed Baakisimba, a dance of the Baganda people, which was historically performed by women while men played instruments. In another song, Avulekile (The Heavens are Open), performers sung both Zulu, an indigenous language of the South African Zulu people, and English. The song, which has become popular among gospel choirs in South Africa and beyond, is sung during celebrations including weddings and funerals. During our concert at the Tang, it was accompanied by backup singers, a synthesizer, ukulele, and a Western fiddle. Meanwhile, the backup singers performed choreography reminiscent of modern dance styles. My duet with Skidmore Lecturer Josh Rodriguez—I on the African djembe and he on the violin—was called N’golo N’golo. Inspired by a traditional fishing song from Buganda (Uganda), it is based on two nonsense syllables used by a lead fisherman to call upon others to fish. It was an amalgamation of African and Western musical idioms. The violin simulated a traditional fiddle of the Baganda people by playing near the bridge. At various moments, we engaged in nonverbal conversation reminiscent of master musicians in multiple African societies who use drums to speak to one another. Three drumming pieces were presented. Manjani is a West African drumming piece that accompanies dancing during celebrations such as the naming of a newborn. Yankadi, common among the Sousou people of Guinea, uses rhythms that mean “it is good to be here” and accompanies a seduction dance performed by men and women in formations of two lines facing each other. Third was Kassa, which accompanies harvest among the Malinke people of Guinea. During harvesting, farmers camp in the fields. While women harvest the crops, musicians (mostly men) play Kassa as demonstration of their support. The climax of the harvest is celebrated with a party in the village during which music and dance are performed. All three works featured multiple drumming techniques accompanied by modern body choreography performed by the drummers themselves. The concert also featured two dances, including Sinte, which is a music and dance style of the Nalu people who live around the Boke region in Guinea. The other was Dijole, also a music and dance piece, from the Temine people, who live along the border region of Guinea and Sierra Leone. Charles Lwanga is a composer, scholar, and educator whose research is ethnomusicology examines the participation of popular music in the transformation of postcolonial Uganda into a more participatory public sphere than before. His creative compositions blending African and Western/European idioms have been read, premiered, and performed in Sweden, Brazil, Norway, South Africa, and the United States. He has a PhD in music composition and theory from the University of Pittsburgh and defended his doctoral degree in ethnomusicology there in summer 2018. Lwanga also holds an MA and BA in music from Makerere University in Kampala, Uganda, a diploma in law from the Law Development Centre in Uganda. Originally published in Accelerate: Access & Inclusion at The Tang Teaching Museum 2 (2018). Lwanga, Charles. 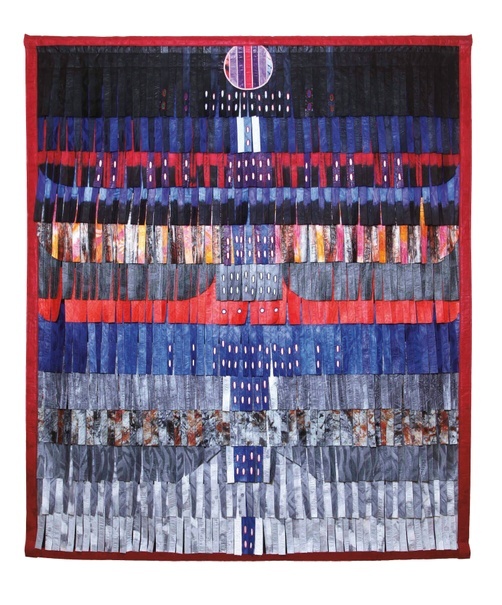 “Musicking the Collage, Charles Lwanga on African Music, Dance, and Art.” Tang Teaching Museum collections website. (https://tang.skidmore.edu/collection/explore/55-musicking-the-collage).